On the 20th November 1998 Roscosmos launched the Zarya module, the first element of the International Space Station. A few days later on the 4th December NASA launched the Unity module and the Space Shuttle crew connected the two main part of the station. I think the rest is history. Here is my small contribution to pay respect to this amazing project! You will see six of my own photographs taken with amateur equipment from London, UK. I put a circle on every photo to mark the famous Zarya-Unity pair. 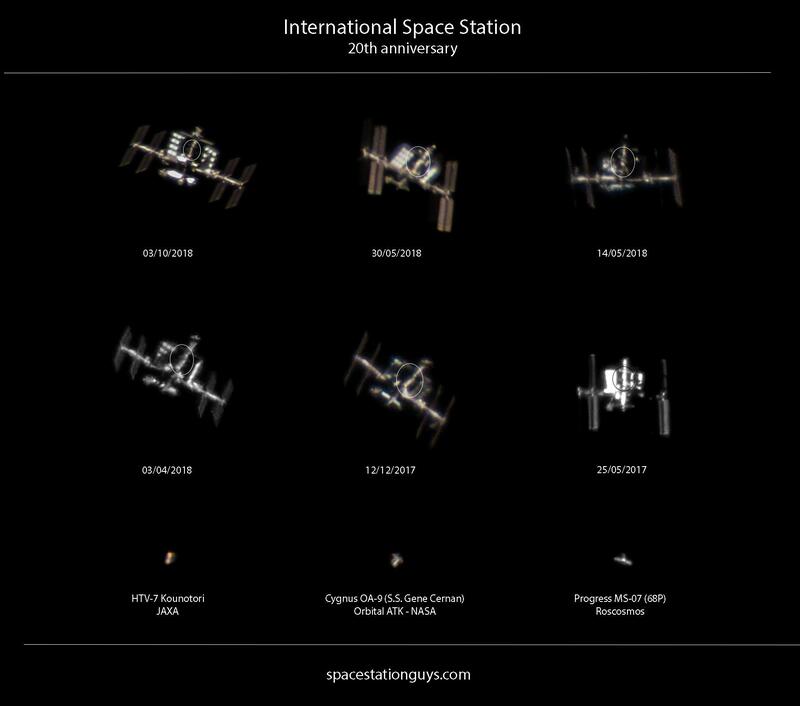 Take a look how big the ISS grew in a few years time. The International Space Station became the symbol of international cooperation, all the research has been done since for the benefit all mankind. This video is about the STS-88 Endeavour mission, the assembly of the first two major component of the Space Station. The bottom row on my photo is dedicated to the cargo side of the supply chain, the workhorses of the station. They keep sending vital food supply, replacement components and cool scientific equipment to and from the station with these vessels. This is my personal achievement on taking photos of these tiny spacecrafts. Is not it amazing to live in times, when anyone can buy telescopic equipments, high frame rate cameras and take photos like this from Earth! We don’t know, for how long can we enjoy the presence of this marvellous machine, so enjoy whilst we can. Download the ISS Detector app (or any app, there are many luckily) and watch it form your location crossing the morning/evening sky. More information about ISS related websites and apps in Guide to find ISS section. Happy Birthday ISS! We owe a huge thank you to all the women and men who designed the station, built on Earth, launched to space, assembled, maintained, looked after it and lived on it. The perfect example how far we get if we work together. We are one species and we get further together!